This post was originally published on December 23, 2009. It was substantially revised and re-posted on February 16, 2015. This short form of Margaret is big in the UK, and could fit right in with Sadie and her sisters in the US. 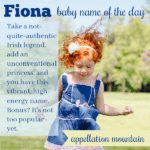 Thanks to Laura for suggesting Maisie as our Baby Name of the Day, and to Audra, for suggesting the update! The enduring Margaret has many a nickname: Maggie and Meg, Peggy and Daisy, Greta, Gretchen, and, of course, Maisie. In Scottish and Irish, Margaret became Mairead – you can listen to the two most common pronunciations here. Maisie first evolved as a nickname for Mairead. It’s also spelled Maisy and Maizie and you can probably find a Mayzee, too, if you look long enough. But this name has long been undiscovered by American parents. In England and Wales, however, Maisie has spent the last few years in their Top 100. Henry James’ 1897 novel What Maisie Knew chronicles the early years of a young girl whose parents divorce and generally behave badly. It became a critically acclaimed movie in 2012. Actress Maisie Smith played the future Queen Elizabeth I as a child in The Other Boleyn Girl and went on to appear on EastEnders. Maisie Wylde was a character on British soap opera Emmerdale. Maisy Mouse stars in a series of children’s picture books, with friends like Tallulah the Baby Chicken. A show based on the books aired on Nick Jr.
Dr. Seuss’s Daisy-Head Mayzie is about a schoolgirl who sprouts a yellow flower from his head. Jacqueline Winspear gave us Maisie Dobbs, a nurse in the Great War who returns to London and sets up a detective agency. Game of Thrones also has a claim on this name, thanks to young actress Maisie Williams, who plays Arya Stark on the HBO series. But the best known Maisie was Ann Sothern’s character, born on the big screen and later given her own radio show. Sothern’s character was Mary Anastasia O’Connor, an aspiring dancer who answered to the stage name Maisie Ravier. The fictional Maisie never quite got her big break. But Maisie made Sothern a star. The first film debuted in 1939. Several big screen sequels followed in the 1940s, and migrated to CBS radio. If you’ve ever uttered the phrase “Likewise, I’m sure,” then you’ve channeled the memorable Maisie Ravier. While many women might have used this short form for Margaret over the years, there’s no way to know for sure. What we do know is that Maisie was poised just outside of the US Top 1000 in 2013. 214 newborn girls were given the name – a new high. With names like Sadie and Hattie racing up the popularity charts, it’s no surprise to find sweet Maisie catching on, too. Factor in the rising popularity of Mae and Maeve, and it’s easy to imagine this Mae name appealing to many parents. Just like Molly now feels like a name completely separate from Mary, it’s tough for many to connect the dots between Maisie and Margaret in 2015. If you’re after a short, sassy name less common than Lucy, with a decidedly retro feel, Maisie is one to consider. What do you think of Maisie? Is it more of nickname, or does this name work on its own? 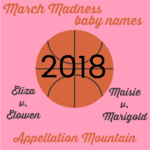 We are going to use Maisie as a nickname for Mary Elisabeth, coming in April! My toddler is Margaret nn Maisy, and we love it. We get good feedback except some people think it’s “Macy” and really can’t seem to hear a difference. Also no on ever guesses the right spelling. We call her Maize or Maisy-may. My parents call her Daisy. Whenever I have to explain her name to someone, I say “it’s just like Daisy, but with an m.” We picked the y spelling instead of ie because it seemed slightly less cutesy. But we like having Margaret as her real name in case she ever wants more options or a more serious name. Another prominent Maisy is the child actress on the show Nashville, who is also a musician with her sister Lennon. It’s on our short list for future daughter names to go with our little Hugo James. Hubby said he’d want to name her something more proper and nickname her Maisie, but I think it can stand on its own. I thought with a classic middle name it would work. Maisie Charlotte or Maisie Louisa. We also thought of using a name like Mabel and then giving a middle name with a Z or S sound. How cool would Mabel Zelda or Mable Suzanne be nn Maisie? Mabel… now there’s another name I could get behind. I think I might just be digging the whole “May-” family. And Mabel Jane is glorious! Because we will soon have a little Mabel called Maisie in our family, I recently did a search to see if that was a combination used back in the days when Mabel was so popular in the U.S. (Mabel was among the top 25 names for baby girls born between 1880 (and before) and 1903, peaking at #15 in 1891.) I haven’t come across that pairing in the U.S., but have found four in England where Maisie has been more widely used. My favorite of these is Mabel Jane (called Maisie) Comley who was born in 1905: http://freepages.misc.rootsweb.ancestry.com/~ianherbie/wp01_112.htm. I like Maisie best as a nn for the more formal Margaret or Mabel. I also noticed, since I am revisiting this post after a few weeks, that only the first three paragraphs are visible. Has the rest been archived? Maisie May is very cute (and Edwardian with the alliteration), but maybe a little two cute for a grownup. Another Mazie in the news is the new US Senator from Hawaii, Mazie Hirono. She was born in Japan to a Japanese-American mother and moved to Hawaii at age 8. Her full name is Mazie Keiko Hirono (in Japanese Meiji Keiko). Ooh … thanks, Patricia – great info! My name is Maisie and nobody has every called me ‘crazy maisie’ or anything such. I like this name. I get called Maymay may mais etc…… I think its cute for a kid and as a adult and if you really mind it a lot you could go with May as an adult. My name is Spelled MAZY its my full name my middle name is MAE…MAZY MAE everyone loves it i have never been teased. everyone i meet loves my name they think its so unique and beautiful!! I think it’s the most beautiful girl’s name out there. My old married last name had a Z in it so I planned that if I ever had a girl she would be Mayzee Eliza Azevedo……..That marriage didn’t work out so Now I have a little Maisy. I like that it looks like Daisy. We named our daughter Maiza Madeline and her nickname is Maizie may. I adore the name and have never met another Maiza. She is proud of her name and loves that it is unique! Funny, because I am called maisie, and I cannot STAND the name margaret! And as far as I know, my parents had no intention in calling me that. The name maisie isnt a nickname – its a full name as well. 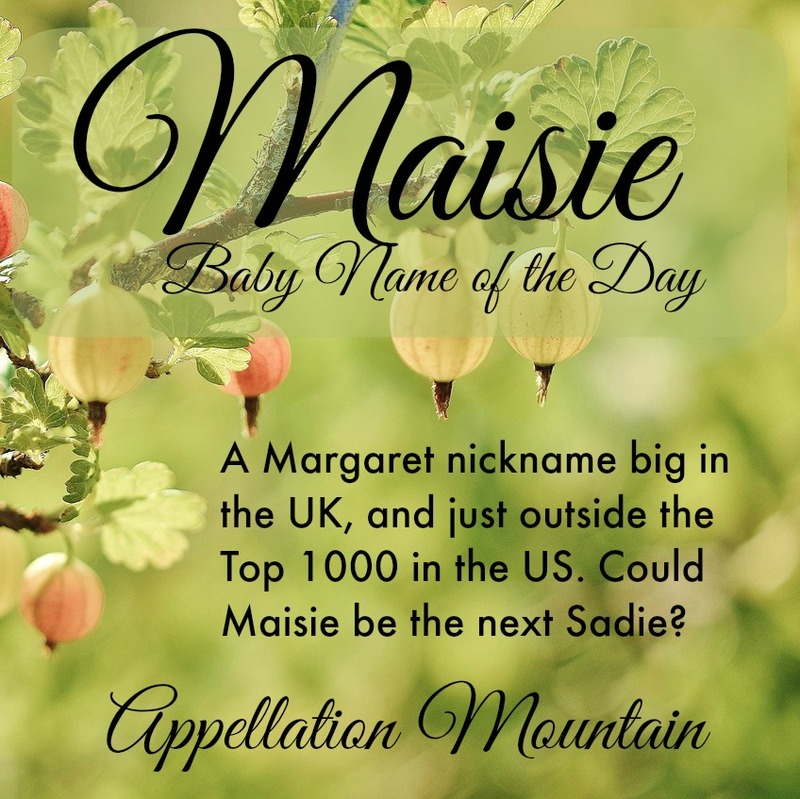 If you are considering the name maisie, go for it, as it is perfect for babies, girls and women and its just a lovely name, i just think its great, and its really worked out for me, as its such a pretty name. I never get teased about my name really, i just get called “crazy maisie” and “maisie moo” and thats it really! Guess this is an old website but couldn,t resist commenting on the name.Hi! My name is Maisie!Really! I am Maisie Elaine Christine.Gone through my whole life with this name and actually like it because it is different so it makes me unique.My parents were born in England although I am Canadian.I often wondered what my name meant and for many years could never find it in those books that give the meaning or origin of names for babies,but have since found out that it seems to be a Scottish diminutive of Margaret.Some people have actually asked me ,quote “But what,s your real name?” They think Maisie is a nickname.I have only ever met 2 other ladies with this name while I was growing up.I married a man whose mother,s name was Daisy so that was at times a bit confusing for some people.I named my daughter Christine,always loved that name.I believe my mother named me after her sister-in-law Maisie in England.My mom,s name was Gertrude and she hated it.Her family called her Joy.So anyway, I am happy to be Maisie for anyone who is interested to know how the name affects some one as they are growing up.I like it and I wouldn,t change it for anything. The other 2 ladies I knew have both died,so no one else I know has this name.I like being different and unique.Someone has a dog with this name!! That is so cute.Funny too!Thx for listening.BFN. Maisie. But yeah, I could see me naming a girl Margery and calling her Maisie – Daisy on a regular basis easily. I find Maisie sweet, if a touch airy. And the mouse doesn’t bother me at all! You know, it does make a great dog name! You’re right. Ah, Maisy. Not for me (I’m sure no one’s surprised). It’s just so cutesy. 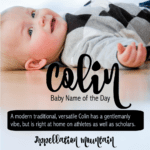 Fine for a nickname for a child, but as a full name? Nope. 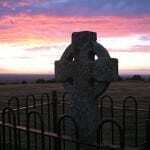 Bek – thank you so much for providing that link! That was very sweet and helpful of you. I’m new here, so please forgive me and bear with me if I mention names that have been listed before. But truly, that was very kind of you. Thanks 🙂 I went and commented on it. Were I ever to have to use the name Margaret, she’d be Maisie 100% of the time. I love the nickname, but can’t really stand the full name. Maisie’s definitely my favorite Margaret nickname. I could get behind Daisy, I guess, but it would take some convincing. My daughter LOVES the Maisie series of books, so all I can see when I hear the name is that little mouse. I would never choose it for a baby with that connotation. I love the name Maisie too. Found it in 2005 when I was looking for popular British names that are unusual over here in the US. I like the May sound – May / Mae alone wouldn’t work with our last name. I also figured I’d have to spell the name all the time for everyone. Four years on I’m glad we didn’t go with something quite so ‘cutesy’ (I guess the -zee ending does that.) Back then I disliked the name Margaret, but lately I’m starting to like that one some more – though Maggie is the more natural nickname, as you said. I think it’s funny that you didn’t like the rhyme with Crazy because my little Maisy is CRAZY. She knows it. She calls herself Crazy Maisy. I call tell her “quit being so lazy little maisy” and she giggles. That is fun! I would have gone with it, but my husband didn’t want to. Personally, the name doesn’t appeal to me. I know that Meryl Streep’s daughter goes by Maisie. I find the name a bit gimicky; I don’t know why. It just does not attract me. I think it’s a bit too nicknamey as a full name. This is actually quite odd, since I am very open-minded about names and very few names I honestly dislike. It also reminds me of the Afrikaans word for girl – meisie. I think the language connotation puts me off it. It would be like calling my daughter “Girl”, for me. Meryl Streep’s daughter is actually nicknamed Mamie, I believe. Right you are, Eva! Her name is Mamie Gummer, and is apparently anickname for Mary Willa. http://www.imdb.com/name/nm0336701/bio I think Meryl is a Mary, too. I love Maisie. I had a great aunt Maisie and she was brilliant. Seriously contemplating calling a daughter Margaret (after my maternal grandmother) just so I can call her Maisie 🙂 Though I love Maggie too so maybe she’d have two nicknames! !